You may still be able to book by calling the hotel at 813-769-8300. Whether you’re in town for work or merely to be seduced by the Cigar City, the Embassy Suites Tampa – Downtown Convention Center is there to take care of you. 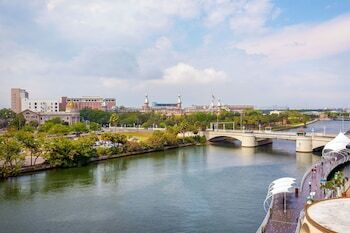 Within walking distance of the hotel, you’ll find great attractions like the Florida Aquarium, Busch Gardens and Raymond James Stadium -- home of the Tampa Bay Buccaneers. Each suite at the Embassy boasts both a living area and a separate bedroom, where you’ll sleep easily on the Suite Dreams bed by Serta, with its 200-thread count linens and hypoallergenic pillows. You’ll also delight in modern comforts like high-speed Internet access, a 37-inch flatscreen TV and a clock radio with MP3 player connectivity, so you can kick back with your favorite playlist. Admit it -- you wish you were here right now. Embassy Suites Tampa Downtown is a 3.5-star hotel located at 513 S Florida Ave, Tampa, FL 33602, US . Its nightly price usually falls between $125.13 per night and $596 per night, excluding tax, depending on room category. 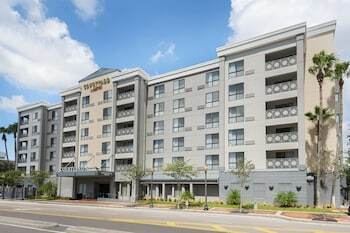 $125 per night found for a Hilton Honors Discount -Honors Semi-Flex - 2 Room Suite-1 King Bed-Nonsmoking - Wifi Avl-Sleeper Sofa-Microwave-Refrigerator room type. 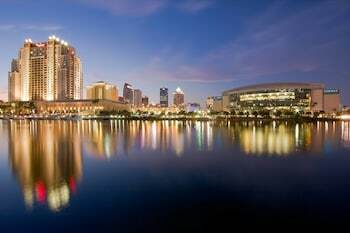 Embassy Suites Tampa Downtown sells rooms through sites like Room 77, Expedia, Hotels.com, GetARoom, and many others. Room 77 searches across dozens of different sites to find the lowest discount rates available. The lowest rate we've seen over the last few weeks was found on Room 77. In 1% of the cases we surveyed, all sites offered the same rate. You can compare real-time rates from all of these sites on Room 77. Room 77 is the only hotel shopping site that includes special discounts like AAA, senior, government, military, and corporate rates.